The economy of Manchester is amongst the largest in England. Manchester is a city and metropolitan borough of Greater Manchester. It lies within the United Kingdom's second-most populous urban area, with a population of 2.55 million. 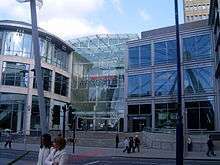 Manchester's commercial centre is in Manchester city centre, focused on Spinningfields, Mosley Street, Deansgate, King Street and Piccadilly. Historically, the world's first industrialised city, the region was once in economic and population decline. In 2012 Greater Manchester South, which includes the cities of Manchester and Salford and three other metropolitan boroughs, was the largest NUTS3 area outside London in economic terms, and growth was 3.8% vs the Core Cities average of 2%. Between 2002 and 2012 Greater Manchester South grew 45% vs. national growth of 44%. Meanwhile, the 2011 census also showed that Manchester was the fastest growing city in the UK in terms of population. Manchester is also a city of contrast, where some of the UK's most deprived and most affluent neighbourhoods can be found. According to the 2010 Indices of Multiple Deprivation Manchester is the 4th most deprived local authority in the England. On the other hand, Greater Manchester is home to more multi-millionaires than anywhere outside London, with the City of Manchester taking up most of the tally. In 2013 Manchester was ranked 6th in the UK for quality of life, according to a rating of the UK's 12 largest cities. Manchester is considered to be a 'beta' global city, rated as the second most globally influential city in the UK after London. The region is now an economic knowledge-led centre, with research and enterprise clustered around the University of Manchester,Template:Rp:136 where research ranked as the third most powerful in the UK behind Cambridge and Oxford. Typical industry areas include: digital and creative, financial, legal and business services, biotechnology, advanced manufacturing, environmental technologies, tourism, global sports brands, media and real estate. The city is also a key location for many foreign owned companies and headquarters, and almost half of the Northwest's Top 500 businesses,.Manchester City Council also plays a uniquely active role in business, where it owns key infrastructures such as a 35.5% stake in Manchester Airports Group, which owns other UK airports such as London Stansted Airport, and is the owner of the City of Manchester Stadium, home to one of the world's highest earning football clubs. Manchester is a major headquarters location, with a growing number of global, European and national headquarter offices. International property experts Cushman & Wakefield have ranked Manchester as the best city to locate a new headquarters operation largely down to ease of access to a pool of knowledge and global connectivity. Companies with global headquarters in Manchester include Umbro, PZ Cussons, and The Co-Operative Group. Manchester is also the European headquarters for companies like Brother, UAE firm Etihad Airways and India's Aegis. Kellogg's, Adidas, Siemens and Totesport are amongst hundreds of firms with national headquarters in Manchester. The pedestrianised Market Street forms the core of the city centre's retail area. 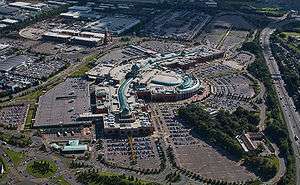 It is dominated on the north side by the Manchester Arndale and a branch of Debenhams. The city centre also has smaller centres including The Triangle, which caters to youthful and upmarket clientele, and the Royal Exchange Centre. The Shambles includes Harvey Nichols, Marks and Spencer, and Selfridges stores, as well as a number of designer boutiques. Overall, Manchester has the highest number of "premium retailers" and in 2010 turnover in Manchester city centre was £921m. Under government plans, Manchester Piccadilly will be connected to London via High Speed 2, a high-speed railway, by 2033. Trains will also stop at Manchester Airport. Journey times from Manchester to London are expected to reduce from 2h:08m to 1h:08m. Manchester is at the forefront of cloud computing, with companies such as Cisco, Oracle and EMC all located in the city, and IBM is currently developing virtualised environments for cloud computing in their Manchester research laboratory. Outsourcery, the UK's leading provider of cloud computing solutions and mobile-centric Unified Communications to SMEs, is headquartered in Manchester. Several hosting and colocation providers such as UKFast and Daisy Group have invested in new data centres in Manchester to support cloud computing. Manchester is also popularly known for its major football clubs, Manchester City and Manchester United, both have a combined revenue of €740m (Manchester City - €316.2m and Manchester United - €423.8m). Both clubs popularity places Manchester as the second richest footballing city in the UK by revenue. Only London, with three clubs (€760m - total revenue of Chelsea F.C., Arsenal F.C. and Tottenham Hotspur) can boast better figures according to the 2010-11 Deloitte Money League table. ↑ "2011 Census – Built-up areas". ONS. Retrieved 1 July 2013. ↑ "Manchester: a phoenix rises". KPMG. 1 2 3 4 5 "ONS Regional GVA - December 2013". Retrieved 19 December 2013. ↑ "Census 2011: Five lesser-spotted things in the data". BBC News. 17 July 2012. ↑ "Wealth hotspots 'outside London'". BBC News. 7 July 2004. 1 2 Balfe, Richard. "Deloitte Football Money League 2012" (PDF). Deloitte. Retrieved 28 January 2013. ↑ Beckford, Martin (14 August 2012). "London slips down list of best cities despite glorious Olympics". The Daily Telegraph. ↑ Hough, Andrew (22 February 2011). "Manchester 'better' place to live than London, global study finds". The Daily Telegraph. ↑ Emilia Istrate and Carey Anne Nadeau (2012). ‘Global MetroMonitor’. Brookings Institution. www.brookings.edu/research/interactives/global-metro-monitor-3. ↑ , Population change in core cities, Manchester.gov.uk. 1 2 , Invest in Manchester. ↑ , Invest in Manchester. ↑ , BBC News - DHL sign up for site in Manchester's £800m Airport City. ↑ "Table 3.4, ONS Regional GVA - December 2013". Retrieved 19 December 2013. ↑ "Manchester - Employee Jobs - Area Comparison". Nomis - Official Labour Market Statistics. Office for National Statistics. Retrieved 2010-10-10. ↑ Harris, Joanne (30 January 2006). "The North West". The Lawyer. Retrieved 2009-04-18. ↑ Barry, Chris (8 November 2007). "New tenants in Spinningfields". Manchester Evening News. Retrieved 2009-04-18. ↑ "Joint British-Chinese partners to construct new £800 million Manchester 'Airport City'". HM Treasury. 13 October 2013. ↑ "Manchester City's 'world capital of sport' scores with Manchester city council chiefs". Manchester Evening News. 14 July 2011. ↑ Williams, Zoe (30 September 2011). "We all love Manchester. But it's nothing to do with politicians". The Guardian. London. Retrieved 2011-10-11. ↑ "About Our Airport and Our Group". www.manchesterairport.co.uk. Retrieved 25 October 2010. ↑ "Northern Hub Technical Study" (PDF). Retrieved 2013-04-13. ↑ "Rail investment proposed for North England cities". Network Rail. 16 February 2010. ↑ "Future extensions". Transport for Greater Manchester. Retrieved 19 May 2013. By 2016 the expansion programme will mean Greater Manchester will have the largest tram network in the UK. ↑ "Stagecoach welcomes government funding for Greater Manchester transport strategy". www.stagecoachplc.co.uk. 9 June 2008. Retrieved 25 October 2010. ↑ Wakefield, Jane (14 January 2010). "Manchester to gain fibre network". BBC News. ↑ "Manchester's Digital Swagger". Insider Media Ltd. 2 February 2010. Retrieved 2010-02-25. ↑ "www.ManchesterSEO.org". 2 February 2010. Retrieved 2010-02-25. ↑ "Tourists go mad for Manchester". menmedia.co.uk. 7 July 2010. Retrieved 25 October 2010. ↑ "adidas Group Careers". www.adidas-group.com. Retrieved 24 October 2010. 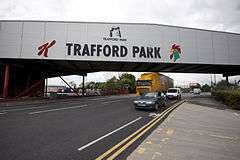 ↑ "Adidas development boosts Trafford Park". www.dwf.co.uk. 16 January 2008. Retrieved 24 October 2010. ↑ "99: Adidas UK". www.timesonline.co.uk. Retrieved 24 October 2010.